Iran’s Foreign Ministry today rejected a call by Russian President Vladimir Putin that all foreign troops should leave Syria after intra-Syrian peace process begins, the Iranian media reported. No one can force Iran to do anything. Iran is an independent country, which determines its own policies. "Iran’s presence is based on the Syrian government’s invitation, and its objective is to fight terrorism and defend Syria’s territorial integrity,” Foreign Ministry Spokesman Bahram Qassemi said at a press briefing in Tehran. “And as long as the Syrian government wants, Iran will continue to assist the country. Those have entered Syria without the Syrian government’s permission should leave,” Qassemi added. Tehran and Damascus have consistently called for the withdrawal of American and Turkish forces from Syria. The remarks by Russia, Iran's ally in Syria, also sparked a great deal of debate and concern in the Iranian press. “It appears that although Russia is holding talks with Iran and Turkey in Astana, the capital of Kazakhstan, on the peace process in Syria, it may have determined to seek a resolution to the Syrian crisis in partnership with the Western parties – a decision that could overlook Iran’s interests in the Syrian crisis,” wrote reformist daily Shargh. “One sign of this alignment [between Russia and the West] is the call on all forces of Iran, Turkey and Hezbollah to leave Syria, which means that all should go and only Russian forces remain in Syria,” it added. Comment: Putin made the remarks during a meeting with Syrian President Bashar al-Assad in Sochi on Friday. While Putin did not specifically name Iran, Alexander Lavrentiev, the Russian president’s envoy for Syria, said later that Putin’s comment also included Iranian and Lebanese Hezbollah forces. What may add to Tehran’s worries is that Putin made the statement just days after Israeli Prime Minister Benjamin Netanyahu met with the Russian leader in Moscow. Israel has recently stepped up military operations against Iranian forces in Syria, frequently targeting Revolutionary Guards’ bases across the country. The article in Shargh also indicates that Tehran is wary of Russia’s multi-front diplomatic efforts aimed at shaping the future of post-war Syria. Tehran has long been worried about a potential “grand bargain” between Moscow and Washington over Syria at the expense of Iran’s interests. Russia’s diplomatic engagement on the Syrian conflict with Iran’s regional rivals such as Israel and Saudi Arabia also troubles Iran. While Russia and Iran have been cooperating closely in the Syrian conflict, their vital interests and endgame strategy in Syria are not entirely the same. The Russian military intervention was instrumental in avoiding the fall of the Assad regime. But now that Damascus and its allies are in control of key population centers, Russia is apparently seeking to foster a political solution to end the conflict in Syria and preserve its gains there. Iran, however, is determined to keep its forces and militia allies in Syria to project power and expand its influence across the region. Iranian-backed militia forces have made it clear that they will use their presence in Syria to fight Israel next. But all this does not mean that the Moscow-Tehran strategic cooperation in Syria will end anytime soon. 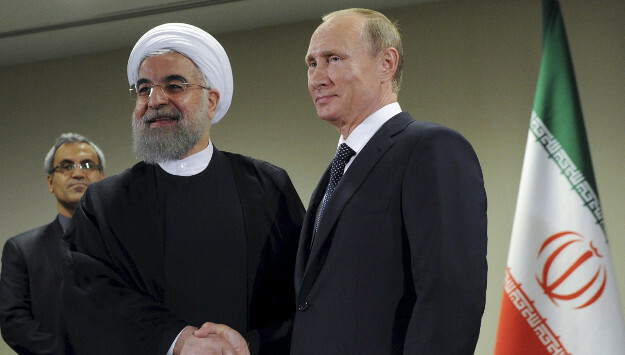 Russia needs Iran’s cooperation in Syria as Iranian-led forces are in charge on the ground. Former U.S. National Security Advisor Lt. Gen. H.R. McMaster said that “about 80 percent of Assad fighters are Iranian proxies.” Indeed, Iranian-led forces are playing a key role in providing security for Russian military personnel in its Syrian air and naval bases.